Gangs call themselves the Bloods, Gangster Disciples, Sur-13, Kurdish Pride and dozens of other names. Some are chapters of national brands. They recruit in schools and in parks. Girls are joining at increasing rates, and affiliation among whites is on the rise — shattering stereotypes that gangs attract only minorities and boys. The percentage of Middle Tennessee's crimes caused by gangs is unknown; police don't track it consistently. But authorities say they see enough new activity to know it's on the rise. "(Gangs) are at a crucial point evolving into increasingly organized hierarchies with educated leaders," TBI Director Mark Gwyn writes in the TBI report. "The amount of crime that stems from gangs, especially drug sales, is significant." In a smoke-filled apartment in Jackson, 10 gang members gathered for a meeting. A painting of the Virgin Mary hung on the wall above the leader. He called himself Crazy Joker and said he oversees the Sur-13 gang in Tennessee. 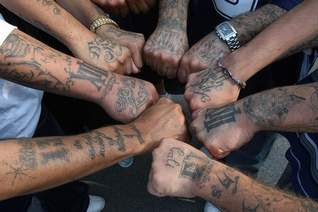 Sur-13 is one of the nation's fastest-growing gangs and pledges allegiance to the Mexican Mafia, a Mexican-American criminal organization. "We're in it to make money," said Crazy Joker, whose real name is Renaldo Garcia. But on this night the gang met to talk about punishing one of its own. A rival gang in Williamson County took a shot at a Sur-13 member during a drive-by shooting near the Cool Springs exit on Interstate 65. No one was injured. But a Sur-13 member violated gang rules by not coming to the aid of the fellow member. At stake was a possible beating — between 13 seconds and a minute long — for the errant gangster. The length of the beating depends upon the violation. "We're here to talk about violations,'' Garcia said. "We're going to decide what happens to some of our vatos (men) who didn't help a homey. ''Members listened and debated, handguns poking from their pants as they drank beer out of cans.At one point, a gang member who had just been released from jail said he wanted to talk about how the gang could make some money. But Garcia kept the conversation focused and said it was important to follow the meeting agenda.